Just in the nick of time for the Summer Olympics, Ripple has been released over at the Windows Phone Marketplace. 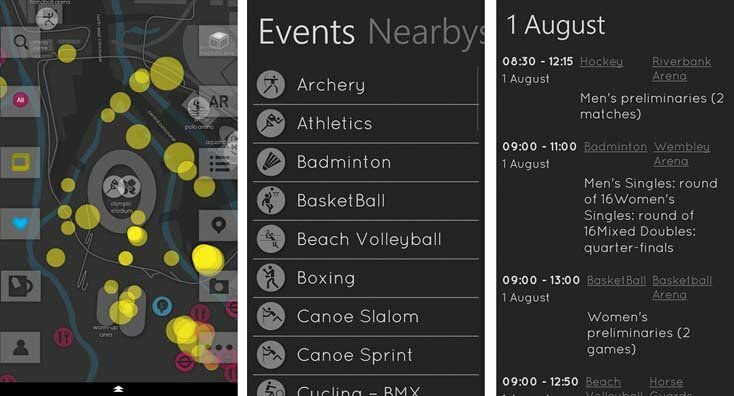 Ripple is a map based companion app for the 2012 Olympic Games in London (that start Friday). 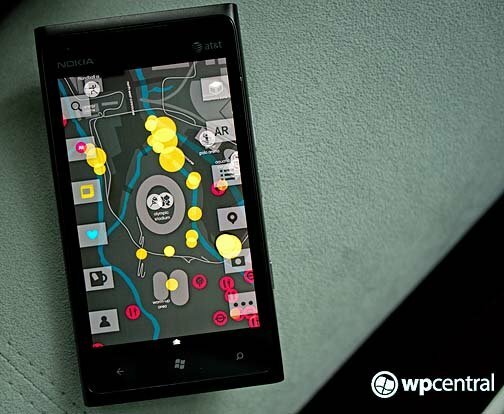 The app offers two views, a map view and an augmented reality view. Information tabs line the sides of the screens and an image/attraction filter can be pulled up from the bottom of the screen. From the map view, markers are present to pull up images of the area, information on local attractions (everything from first aide stations to ticket booths to bus stops), and information from the Olympic Game venues. The information on the games includes a schedule of events, information on the sport, and an overview of the sport's rules. Some of the images are rather impressive panoramas of the Olympic venues that can be touch zoomed in/out. Unfortunately you can't save the images to your Pictures Hub (may be copyright issues) with some that would make great wallpapers. The button tiles aren't labeled which means when you first start using Ripple, it's a "trial and error" approach. There is a List Tile (third from the top on the right) that pulls up a listing of all the Olympic events, nearby attractions, and Countries that can come in handy. You also have a schedule listing tile (three-dot tile on the right) that will list the full events schedule by date. One short note about the List Tile is that while Ripple is designed to list nearby attractions in London, if you're not in the London area it will list attractions local to your location. Ripple has support for Flickr, Twitter and Facebook and will update you on scores as well as medal counts. In just tinkering with Ripple for a short period, the app's strength is helping you get around London. It would have been nice if the option tiles were labeled to shorten the learning curve and at times Ripple crashed when trying to access the social networks. I also found some of the markers were slow or difficult to activate to pull up the information. There were also issues in pulling up directions but I am a wee bit away from London and that distance could be causing the problems rather than a bug in the app. Ripple has potential but it may be a good idea to supplement Ripple with one or more of the Olympic apps highlighted in our Olympic App Roundup. There is a trial version available for Ripple that is limited in functionality. The full version will run you $.99. You can grab Ripple here at the Windows Phone Marketplace.